While Lhakar is about devoting one day of the week to our cause, last week, Tibet lost a dear friend who I’m sure devoted much more than just one day a week to Tibet’s freedom. Adam Yauch, of the Beastie Boys passed away last week way before his time. And while I don’t personally know him at all, I thought we owed it to him to at least shed some light on his large contribution to the Tibet movement. 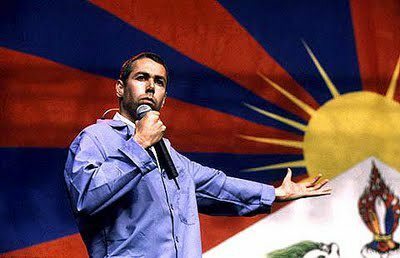 I honestly had no idea who Adam Yauch was then (although over the years, I got to learn about his greatness in music and Tibet activism), I just knew he was famous, and so I followed all my older cousins and took a picture with him. Of course we all had to take individual pictures with him, and I remember him being so patient with all these little Tibetan brats bugging him endlessly for autographs and photos. I then remember him being called up to stage and speaking to the crowd, so calmly, so cool, yet with so much love, respect and passion for Tibet. Beyond just feeling ‘cool’, I remember probably thinking for the first time, that people actually cared about Tibet, the world actually cared. With our small protests growing up, made up mostly of Tibetans, a lot of the time it really did feel like we were shouting with all our might, but no one was listening. Well I really think Adam Yauch and his work was instrumental in making the world stop and listen. And now that I think about it, I don’t think I’m sad because I’ve lost someone who made feel like I was cool, or had so much patience to take photos with a bunch of crazy Tibetan kids, or because as a direct result of his work in the Freedom Concerts I got to see KRS-One speak so passionately on MuchMusic about why Tibet should be free. I know it’s because Tibet lost a great and arguably irreplaceable friend. I met Adam Yauch only once. It was during a bathroom break, which came at the end of a heated session in a Tibet-China conference at Harvard in 2002. I rushed to the bathroom and found myself standing next to Adam Yauch, who was using the urinal to my right. We greeted each other in Tibetan. I was an international relations student at Brown University at the time. They were describing Tibet in a language that betrayed their Han chauvinism, and every Tibetan in the room was visibly distraught. But most of us were tongue-tied, understandably intimidated by the heavy use of political terminology by professors and researchers who hid the ultimate weakness of their arguments behind the cloak of academic jargon. One of the Chinese academics had a deep, commanding voice that made up for his thick accent. He seemed to be aware of the impact his voice was having on his audience, as he continued to lecture the Tibetans about how much Chinese leaders truly respected the wishes of the Tibetan people. Silence fell upon all. The academic had no answer, because the question was direct, simple and honest. It pierced right through all the pretension, and illuminated everything in an instant. This, in essence, represents the monumental impact Adam had on the Tibetan freedom struggle. His compassion, action and creativity illuminated to the whole world the truth of China’s oppression of Tibetans. After backpacking in Nepal, where he met Tibetan refugees for the first time, Adam came home and founded the Milarepa Fund, a nonprofit advocacy organization named after Tibet’s most famous and beloved saint. Milarepa was an eleventh century Tibetan saint whose life and words have provided inspiration to countless Tibetans searching for spiritual liberation, and his story of tragedy and triumphs have served as milestones and benchmarks in seekers’ journey toward enlightenment. His verses, simple and melodious, are sung to this day in the form of songs and opera. It is not hard to understand why Adam found inspiration in Milarepa. Himself a spiritual seeker, Adam turned his musical genius into a force for social and political justice. Taking on the biggest colonial empire on the planet, he became a fierce advocate of Tibetan freedom. Acting upon his belief that change in Tibet can only come through public awareness and grassroots pressure, he reached out to the greatest musicians of the era. He then set about organizing a series of mega concerts in North America, Europe and Asia that came to be known as the Tibetan Freedom Concerts. It was these concerts from 1996 to 2001, attended by hundreds of thousands, and the grassroots awareness they created, that eventually transformed the Tibetan cause from an obscure, fringe issue into a defining political movement of our time. Adam supported numerous Tibetan projects, most visibly Students for a Free Tibet (SFT). The Milarepa Fund, founded by Adam, was one of the three organizations that helped birth SFT in 1994, as an answer to the rapidly growing youth interest in Tibet. Today SFT is one of the leading organizations in the movement. To the end of his tragically short life, he remained a fierce warrior and humble supporter of the Tibetan freedom movement. Ever since we shared that short conversation at the urinals at Harvard, I have always pictured him as a simple, unassuming human being with a heart the size of a universe. Adam was a true American saint. Ummm i guess Chinese wanted to liberate us Tibetan out of kindness just like Japanese wanted to liberate Nanking in 1937. Thank you for sharing your own thoughts on MCA. I am still beside myself with grief, and will be lighting candles for Adam for 49 days after his passing. May we carry on his love and light! Thanks for this obituary. He truely seems to be someone genuinely supporting cause. He went so far to woo a Tibetan girl, eventually marrying her. Condolences to his family. May he reborn swiftly in a Tibetan family.